Particle & Surface Sciences ’ range of test sieves and sieve shaker equipment have been manufactured to meet the quality standards of the industry. Particle & Surface Sciences’ seamless frames provide a precise fit and good quality. All impact sieves meet the applicable standard and are certified to International Standards BS410, ISO 3310/0 and NAMAS 0419, including UKAS. Standard test sieves are available in frame diameters ranging from 100mm to 450mm for European specifications and 8 and 12 inches for American specifications. Particle & Surface Sciences also supply grain sieves, half height sieves and wet washing sieves. Particle & Surface Sciences’ products are specifically designed and tested to work with concrete, aggregates, soil, bitumen, cement, mortar and other materials used in construction projects. Particle & Surface Sciences’ test sieves are available in frame diameters such as 100mm, 150mm, 200mm, 250mm, 300mm, 315mm, 350mm, 400mm, 450mm, 8 inch and 12 inch. All 200mm and 300mm woven wire mesh sieves have stainless steel frames and mesh as standard. The 200mm and 300mm perforated plate sieves have stainless steel frames. The 450mm perforated plate sieves have plated steel frames. The frames of all the standard test sieves are manufactured from stainless steel. Many sizes of test sieves are available as half-height sieves. The wet washing sieves comply with the European and American Standards. 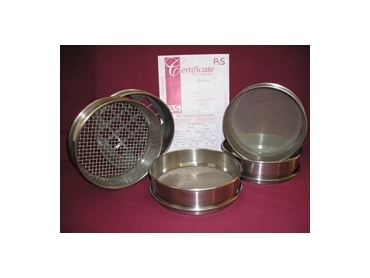 Lids, receivers and receiver/separators are available for all sieve sizes. Particle & Surface Sciences also provide 200mm diameter stainless steel sieves with stainless steel plates with long rounded apertures that can be used for sampling cereals and grains.